AoA DVD Ripper 5.05 - Rip DVD movies onto hard drive in high quality AVI DivX VCD SVCD MPEG 1/2/4 formats. Pocket DVD Studio 4.0 - Record video files(wmv, avi, mpg, mpeg, rm, rmvb, Tivo2go, dvr-ms, mov, etc) and DVDs into portable format(wmv, avi) playable on your device. DVD Audio Ripper 4.0 - Extract movie soundtracks from DVDs and rip DVD audio to MP3, WAV, AAC, AC3, OGG, RA, WMA and AU formats. Flash DVD Ripper 0.90 - Flash DVD Ripper is a piece of easy-to-use DVD ripper software for ripping DVD to MPEG, DVD to AVI, DVD to VCD, DVD to SVCD video formats on-the-fly. Imtoo DVD Ripper 4.0 - Backup your favorite DVD movie into almost all popular video formats, such as VCD, SVCD, DivX, MPEG, AVI etc. PQ DVD to iPod Video Converter 2.5 - PQ DVD to iPod Video Converter converts DVD to iPod Video in 2 clicks, as well as Tivo2Go, DivX and other other popular video files to iPod. Plato DVD Ripper 2.32 - Rip DVD to DivX, AVI, XviD, iPod, PSP, 3GP, Pocket PC, VCD, SVCD video files. 1Click DVD Ripper 2.03 - Copy DVD to VCD/SVCD/DIVX/AVI/MPEG and burn them to VCD/SVCD, copy entire DVD or just partial segment by time or by frame or by chapter. Amadis DVD Ripper 2.0 - powerful DVD ripper application for ripping DVDs to all most video format(avi,divx,xvid,wmv,asf,...) with excellent output quality. Amigo DVD Ripper 2.8 - Copy DVDs to VCD (MPEG1), SVCD (MPEG2), AVI, and Divx(MPEG4) with excellent output quality. 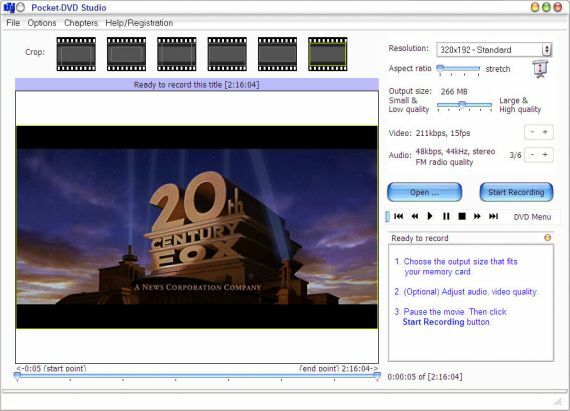 DVD AnyView 2.1.20 - DVD AnyView can convert or backup your personal DVD movies to VCD (MPEG1), SVCD (MPEG2), or AVI/DivX (MPEG4) files with excellent output quality and smaller size. SAGA DVD Ripper 1.2 - DVD ripping software to convert DVD to DIVX, AVI, MPEG1, MPEG2, VCD, SVCD video files or as a DVD backup software to backup DVD movies to hard drive. X DVD Ripper 1.2.1 - X DVD Ripper is an easy to use DVD Copying and Ripping software which can convert DVD to VCD, SVCD, AVI, Divx with execellent video and audio quality.